In the manner of W. G. Sebald's The Emigrants, Natives and Exotics follows three characters, linked by blood and legacy, as they wander a world scarred by colonialism. Transplanted halfway around the globe in 1970, nine-year-old Alice, the child of diplomats, is ravished by the beauty of Ecuador, a country her parents are helping to despoil. Forty years earlier, Alice's newlywed grandmother Violet confronts troubling traces of her country's past as she makes a home in the wilds of Australia. And before that, in early nineteenth-century Scotland, Violet's great-great-grandfather George flees the violence of the Clearances for the Portuguese Azores, unaware that he will have a hand in destroying the earthly paradise there. 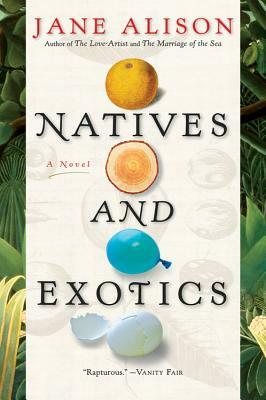 The third novel by the author of the critically acclaimed The Marriage of the Sea and The Love-Artist, Natives and Exotics is a hypnotic meditation on our passionate, uneasy affair with nature, in which we restlessly search for home. JANE ALISON is the author of three novels: The Love-Artist, The Marriage of the Sea, and Natives and Exotics. She teaches in the MFA programs at the University of Miami and Queens University in Charlotte. "Jane Alison takes us where history books can't-or won't-go . . . Though set hundreds of years apart, these stories quickly flow into a single narrative powerful enough to show how closely related our familial, political and natural worlds really are." "Vivid and poignant . . . What gives pleasure is how precisely [Alison] sees the fierce beauty of the natural world, as it moves, grows, evolves, both despite and because of the blind interference of humankind."